The day began with a morning coffee/networking event - a perfect opportunity to connect with new and familiar faces, as well as learning from respected speakers from within the property and auction industry. An Overview of Property Auctions with Tips & Tricks. Starting the morning off with some great energy was Richard Obahor; a property entrepreneur and rising star, with over 14 years of experience in the industry. Originally from Nigeria, he made his mark in the industry as an acquisition agent. With humble foundations, he has refinanced with equity in his first property purchase, and continued to refinance and repurchase, thus enabling him to create a strong portfolio in just short of 2 years. 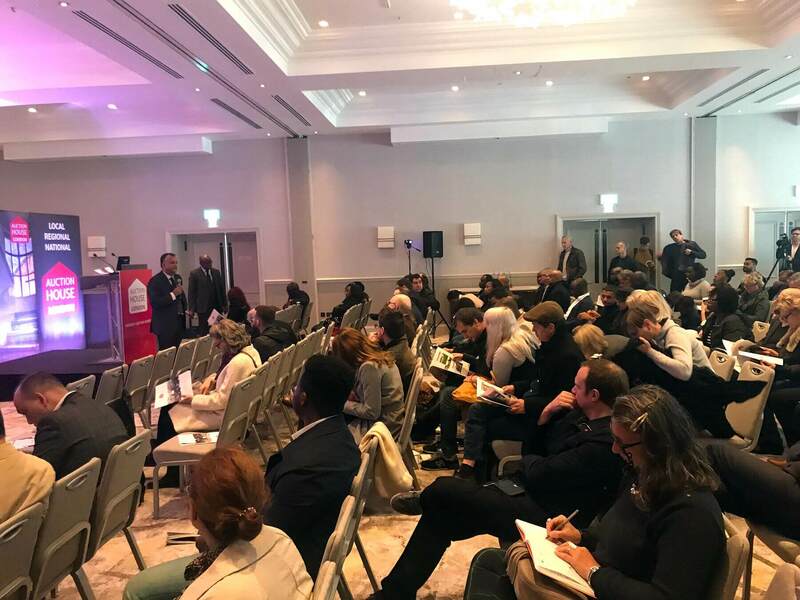 Richard’s presentation discussed reasoning behind property investment, investment strategies as well as key steps to a successful auction process. Buy to Let – Property for the sole purpose to be rented out. Richard re-iterated his belief that to be successful at property investment, profit should be made from day one. He said this could only be achieved by being careful to purchase "the right property" which will make you profit; this could be done by purchasing the property below market value. Look through the auction catalogue thoroughly to identify potential investments. Conduct strong research and do diligence on the identified properties. Are there any costs of bringing the property to the right state? Reading of the Legal Pack and understanding it. 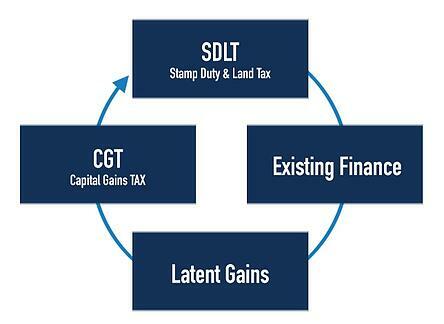 How much further capital will need to be injected into the property? 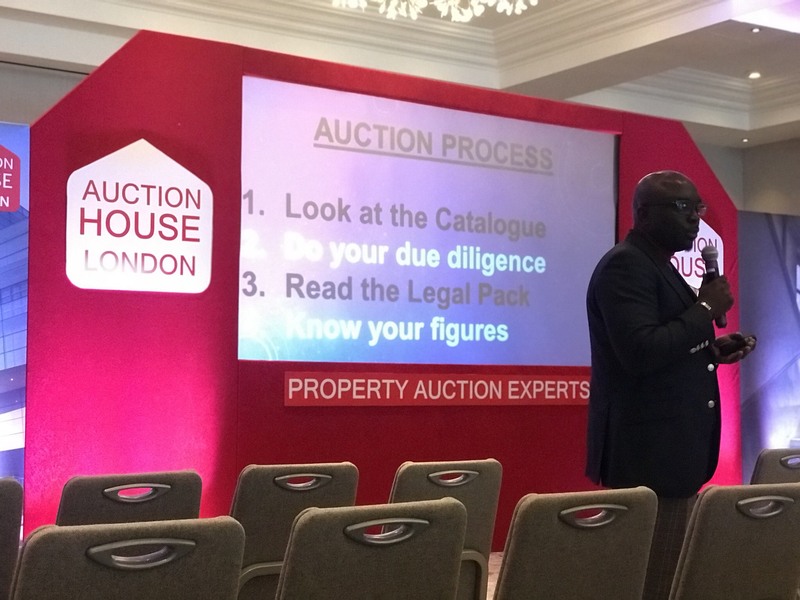 Stick with your figures; Richard was very adamant that to be successful at making a profit from property auction purchases, long term discipline is key, and impulse bidding could lead to issues in the future. e.g. If your budget for a certain property is £100,000, then do not bid more than the figure you have calculated to work for you. Have your exchange funds prepared in advance. Typically, 10% will need to be paid on the day. Get help if you need it and don’t be afraid to employ a professional. An Overview of Changes in the Summer to Tax & Regulation. Ranjan, a well-known and revered character in the property sector broke down the major changes to property investment. Changes to taxes apply to properties owned as individuals (sole traders) – not as limited companies. Therefore, many people are looking to “transfer” properties to a new formation Limited company. Latent gains – when mortgage liabilities are more than the initial cost of property when purchased. Seller will have capital gains liability. Section 162 Relief - Section 162 incorporation is available to help negate the requirement to pay CGT when converting a business to company status. Available to any sole trader business; HMRC will look into whether it as a property business or investment activity. For example, the HMRC would consider the following activity to classify a 'property business' - 20 hours+ spent in the working week relating to property, if your lettings are managed externally, or if a large proportion of your income is from lettings. HMRC have updated their Tax Manuals earlier in 2017, to reduce ambiguity of what is defined as a property business. Refer to HMRC Tax Manuals for their latest guidance. At 11.45am preparations were made for the auction to begin and the room started to fill up with what became an excellent turnout; many were forced to stand around the room due to the number of attendees. Lot 5 - Roof space in Tottenham with planning permission to erect three self-contained flats. (1 x 1 bedroom and 2 x 2 bedroom). Each flat to be held upon a new 125-year lease upon completion. Lot 18 - A unique plot of land in Surrey with 959 years unexpired on the leasehold. 1.5 acres and doesn’t require planning permission due to Part 7 Forestry buildings and operations general permitted development order 1995. The land has multiple opportunities of potential which include a dwelling, outbuilding or recreational use. Interesting fact: this land has been authorised by Surrey police for shooting activities with up to a 0.234 calibre rifle. Lot 50 - A fully let student investment comprising two converted buildings internally arrange to provide 27 student letting rooms. Producing £115,700 per annum in Nottingham. This property is situated in a prime location for students; 400 yards to Nottingham Trent University and its Student Union. Furthermore, as this property is “on campus” it would have a continuous supply of students readily available to let to. Currently all 27 rooms have been let generating £115,700 per annum. This property also has the potential for future residential development. Guide Price: £900,000+, Selling Price: £1.1million. These results providing the new investor an annual yield of 10.52%. 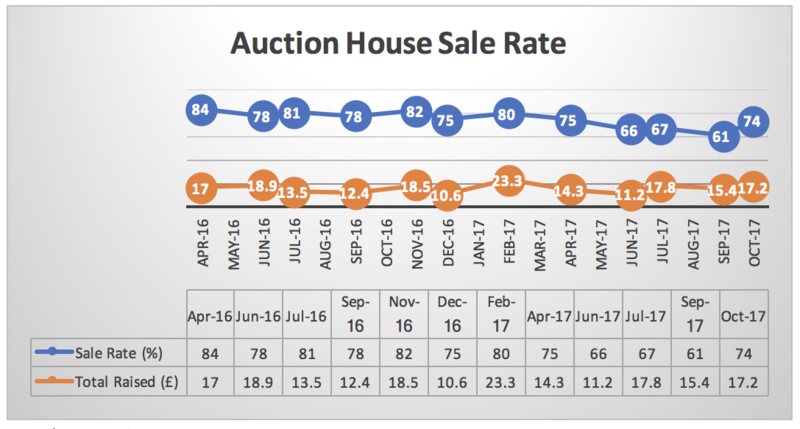 Overall the auction delivered improvements in statistics compared to results in previous months. The total raised over the last few auctions has remained consistent with sales just over £15 million for each auction since July. These results show positive signs of growth taking into consideration the numerous changes to tax and regulation which had created uncertainty and ambiguity in the property investment sector. The total raised at auction has remained steady throughout the summer. October, and previous auctions have been higher volume, lower value. A likely contributing factor is that falls in property prices especially in the high-end central London market, may have meant fewer higher value lots being brought to auction. Are these property owners holding back in selling these properties, knowing that with in the current climate, they would not make figures that they would have originally expected. A sale rate of 74% in October shows potential signs of recovery after a fall between April & September. Whilst the traditionally slower summer season will be a contributing factor to this, there are several other reasons that may have caused both the decline and recovery. are there any reasons for the improvement in sale rate? April 2017 onwards showed a decline in sale rate. Brexit Article 50 being officially triggered would have had a large part to play in this. Changes in tax and regulation also caused uncertainty and the need for the market to learn and adapt. New and stricter Buy-to-let lending rules which came into effect in September contributed to further ambiguity within the market. Investors were put off for the short term, but now they have created Limited companies and made necessary adjustments, has this increased confidence? After the summer holiday season has come to an end, has October seen a return of property investors? Are sellers taking a more realistic view of what their properties are worth, given recent declines in property prices, particularly in London? As buyers are expecting property at better value in turn sellers expectations are being reduced, thus sellers are setting lower reserves on their properties. At this time, it is difficult to provide a conclusive reasoning behind the improvement in sales rate or whether this is just a one-off. 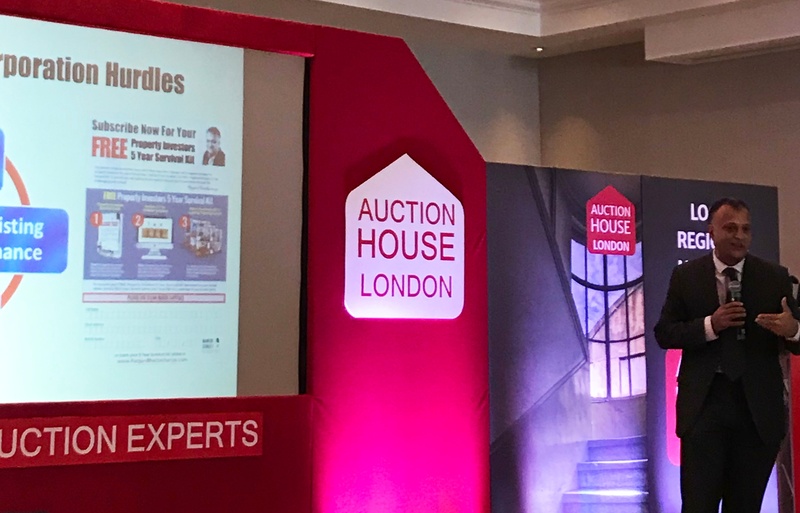 Results from Auction House London's December auctions may provide us with stronger evidence and analysis to the current property auction market. What we do know is that there is still clearly interest in property auction investment with a fantastic turnout in the October Auction. This auction also attracted a number of new potential buyers who attended in order to learn, witness an auction, and prepare for their first auction purchase, suggesting continued future interest as well. For more information on how else you can prepare for property auctions, this blog is for you. Disclaimer: This blog is solely for information purposes and the views, information, or opinions expressed within should not be taken as advice.